For courses in Heating, Air Conditioning and Refrigeration. 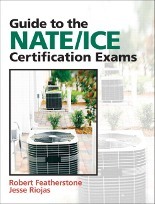 This exceptional review tool prepares students and service/installation technicians to pass the HVAC/R NATE and ICE certification examinations. Divided into two distinct sections, the first part provides a study guide review of essential concepts and procedures. The second part features more than 2,400 self-study questions that cover essential subjects such as system components and tools, electrical theory and application, air flow components and duct fabrication, indoor air quality and safety, hydronic heating, EPA certification, system troubleshooting, and more! Each topic includes a practice test and answer key so readers can assess their understanding of the material.